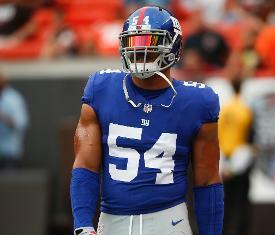 New York Giants defensive end Olivier Vernon is expected to make his season debut Thursday night against the Philadelphia Eagles, but tight end Evan Engram will miss his third consecutive game with a knee injury. Vernon suffered a high-ankle sprain in an Aug. 25 practice and hasn't played since. He practiced on a limited basis all week and avoided the questionable designation for Thursday's game. Engram sprained the medial collateral ligament in his right knee in Week 3 and missed the last two games. He appeared to have a chance to return this week after getting in limited practices Monday and Tuesday, but he missed Wednesday's session and was ruled out. Head coach Pat Shurmur said Tuesday that there would be no consideration given to holding players out on a short week so they could get additional time to heel with 11 days before Week 7's Monday night game. He added that any player deemed healthy enough to play would not be on a pitch count. Kicker Aldrick Rosas (right quad) is expected to play after practicing on a limited basis Wednesday. The team signed Marshall Koehn to the practice squad earlier this week as insurance. Joining Engram in sitting out is wideout Russell Shepard (neck), while tight end Rhett Ellison (foot) is questionable. The Eagles will be without running back Darren Sproles (hamstring), defensive tackle Haloti Ngata (calf), safety Corey Graham (hamstring) and linebackers Nathan Gerry (ankle, knee) and D.J. Alexander (quad). Sproles has not played since Week 1.